. 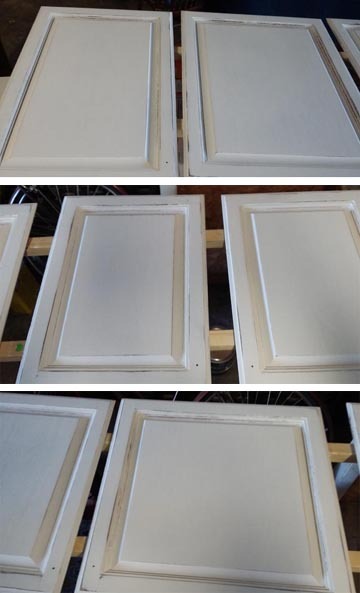 . . . . We will Paint, Restore/ Enhance, or Reface Your Family's Cabinets. . . . .
* * Centralia, Mascoutah, Herrin, and 'All Towns' in between . Repair . Paint . Enhance . Refinish . Reface . Cabinets. Let Us Paint Your Cabinets so You Love them Again. Many people get tired of their cabinet color - we can paint your Cabinets! 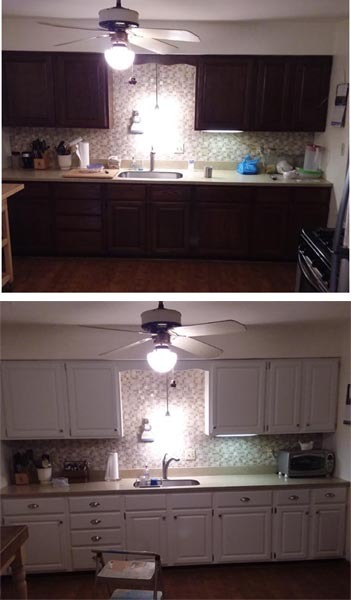 - Call:618-246-6146.
a brand new look; while making the kitchen brighter! The original dark stain was cleaned and sanded. Two coats of primer was then applied. Then two coats of paint, - my client was very happy! The drawers and doors we take to the shop to get sprayed. The cabinet base is cleaned, sanded, and painted in your home. Add new drawer/ door pulls = a brand new kitchen! Again, way less than the price of new cabinets. This of coarse, can also be done with bathroom cabinets. Another look at the Belleville, Illinois cabinets - these also show while work is being done. These cabinet doors show the popular 'distressed' look. The cabinets are painted a color of your choice. Of coarse they are cleaned and sanded first. If you are interestd in painting your cabinets please call. Call for a Free Quote. My cell is: 618-246-6146.